The cover of "Basil in Egyptian Eyes." 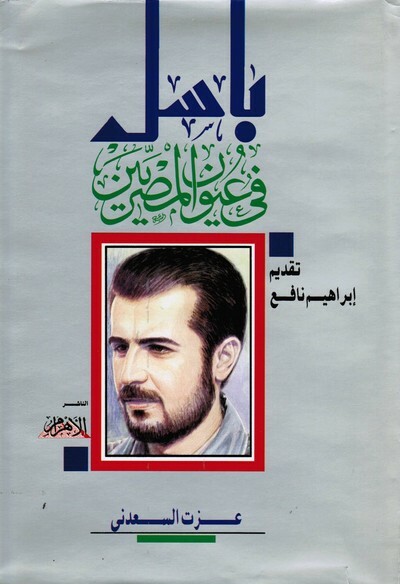 Basil al-Asad, the eldest son of Hafiz al-Asad, lost his life on January 21, 1994, at the age of thirty-one, when, driving at high speed to the Damascus airport for a skiing trip abroad, the Mercedes he was driving crashed. A great national mourning then took place, with black becoming Syria's favored color for many weeks and tributes to "Martyr Staff Major Engineer Basil al-Asad" becoming near ubiquitous. Not surprisingly, Syria's Lebanese satrapy followed suit in hallowing the son's name. More surprisingly, one of Egypt's leading intellectual centers also joined in the adulation. Sa'dani's account begins with a chapter titled "The Earthquake," in which he tells in exquisite detail what he was doing on the fateful Friday and the anguish and alarm he felt on hearing the news of Basil's demise. In chapter after chapter of kitschy prose, Sa'dani takes up such subjects as Basil's youth, his horsemanship ("that will never die"), and Egyptian grief at his passing. Significantly, the final chapter ("Hope") cultivates the myth of the next eldest Asad progeny, Bashshar. The pictures are no less noteworthy: Basil's face appears in some hundred photographs and in a dozen specially commissioned paintings. That Al-Ahram should devote its considerable resources to a foreign ruler's cult of personality can only have two possible explanations: either the Syrian state bribed it or the Egyptian one pressured it. In this case, political dynamics suggest the latter rationale. But whichever it is, the implications for Egyptian cultural life are sad indeed.